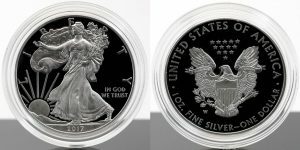 This year’s 2017-W Proof American Silver Eagle scored solid first-day sales of 226,173 coins, but then moved ahead by just 6,837 coins over the weekend for a four-day total of 233,010 coins. The new collectible was, as expected, the Mint’s best weekly seller. The U.S. Mint published sales data for 273 numismatic products. One hundred and forty-three outperformed their prior weekly gains compared to 67 previously. Six of them increased by more than 1,000 units compared to 9 previously. Five products saw their sales total reduced compared to 7 previously. Two of them fell by more than typical amounts, the 2017 Kennedy Two-Roll Sets by 664 and 2017 Kennedy 200-Coin Bags by 731. Below are tables showing the latest sales for U.S. Mint numismatic products. The sales period covers Mar. 20 to 26. Products with an asterisk (*) are no longer available.